A provincial capital in southern Catalonia, Tarragona encapsulates everything that people love about Spain’s Mediterranean coast. For ancient culture it’s one of the best destinations in the country, with a UNESCO-listed ensemble of Roman archaeological sites that date to when this was the most important city in Iberia. You’ll need way more than a day to see everything, and what’s incredible is the way these ruins harmonise with the streets in the old part of the city. There are golden Blue Flag beaches minutes from the city centre, and don’t forget PortAventura, Spain’s top theme park just down the road. 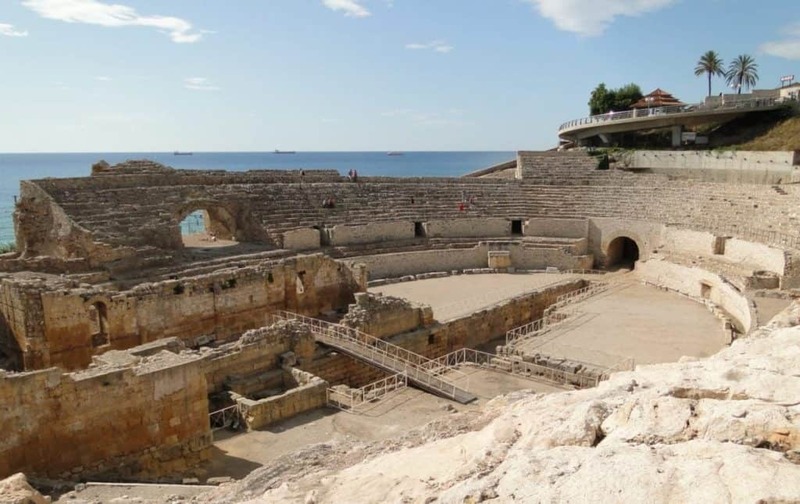 Tarraco’s amphitheatre had an exquisite setting, carved into a steep slope between the Roman walls and the Mediterranean. As you leave the Part Alta this elliptical arena is laid out in front of you and framed by the azure sea. It was built in the late-100s and could hold 15,000 spectators, who would have showed up for some pretty grisly exhibitions like the burning of the city’s early Christian bishop Fructoso during the rule of the 3rd-century Emperor Valeriano. You can easily make out the amphitheatre’s lower basement, from which gladiators and wild animals would have been hoisted up to the arena floor. One of the great things about Tarragona’s romanesque and gothic cathedral is the way it sneaks up on you. The streets around, like Carrer de la Merceria and Carrer Major are compact alleys with traditional local amenities, antiques shops and restaurants. And then on Plaça de Santiago Rossinyol everything opens up and you can see the regal gothic facade. There has been some sort of temple here since Roman times, through the Visigothic and Moorish periods to the 12th century when the cathedral was constructed. Head into the Diocesan museum to see renaissance tapestries and Roman artefacts recovered during excavations at the cathedral between 1999 and 2001. Five minutes north of Tarragona, bridging a pine-wooded valley, is a 250-metre section of an aqueduct that channelled water from the Francolí River to Ancient Tarraco. The monument has 36 arches and rises to 27 metres from the valley floor. If you don’t mind heights you can walk along the specus, where the water flowed, even though the walls of this structure don’t reach far above thigh height on most people! You could combine the aqueduct with a visit to El Mèdol, which was where the limestone for Roman Tarraco was quarried. The quarry is bursting with plant-life as the high walls have created a micro-climate with high humidity. On the west side of the Part Alta you can get up onto the original Roman walls and take a tour of the ramparts where there’s a captivating melange of history. Medieval coats of arms and 18th-century gun positions appear next to original Roman towers and stones with 2,000 year-old inscriptions. These defences have been in place since the 3rd Century BC when Tarraco became a base for Roman forces during the Second Punic War. What’s really interesting is the way the lower sections of the walls are rugged, and clearly much older. A lot of this stone is actually megalithic, and supports more sophisticated defences. It wasn’t until the mid-19th century that the city realised what it had, and excavations commenced at all the various sites around the Part Alta. Nearly all the items uncovered at these digs are displayed here, and there’s a rich assortment of Roman sculpture, ceramics, clothing, coins and everyday household items. They have even managed to preserve a 2,000-year-old fresco of a peacock found at the amphitheatre. The mosaic room also demands your attention, with stunning representations of Medusa and the muse Euterpe. The museum incorporates the Roman Praetorian Tower and also gives you entry to the necropolis and circus next door. 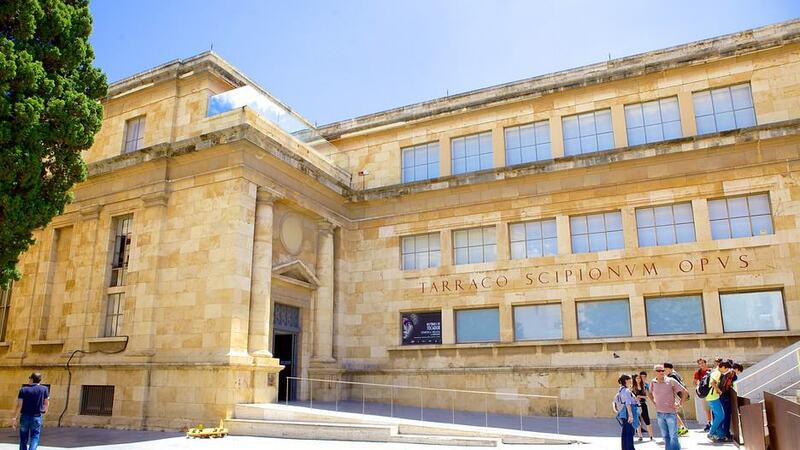 The highest part of Tarragona is also the oldest, and is the site of Tarraco’s ancient provincial forum. For hundreds of years, right up to the late-middle ages, this is where the city’s entire population lived, separated from El Serrallo, which was Tarragona’s seafront community. Now it’s where you should come for a wander, with little streets running beneath houses that occasionally incorporate Roman walls and stonework. Some are preserved as museums, like Casa Castellarnau, a 15th-century Catalan gothic manor house with a lovely patio. At any time of the year people will be out on the squares, chatting over meals or drinks at outdoor restaurant tables. Couples and families stroll on the Rambla Nova up to this lookout with unbroken panoramas of the sea. The iron railings are part of the ritual as you’re supposed to “tocar ferro”, touch the iron for good luck. There are bars, restaurants and cafes along the rambla behind this spot. If you’re in the city in late-June or early-July this is also where you’ll be able to catch the nightly displays as part of the International Fireworks Competition, as they’re launched from Platja del Miracle at the bottom of the cliffs. On a clear winter morning it’s also a divine place to watch the sun come up. We’ve mentioned the Rambla Nova, a sophisticated pedestrian boulevard laid out in the 19th century. On either side are restaurants and many of Tarragona’s high-street brands. From there you could go down or up the hill to see more of the city. 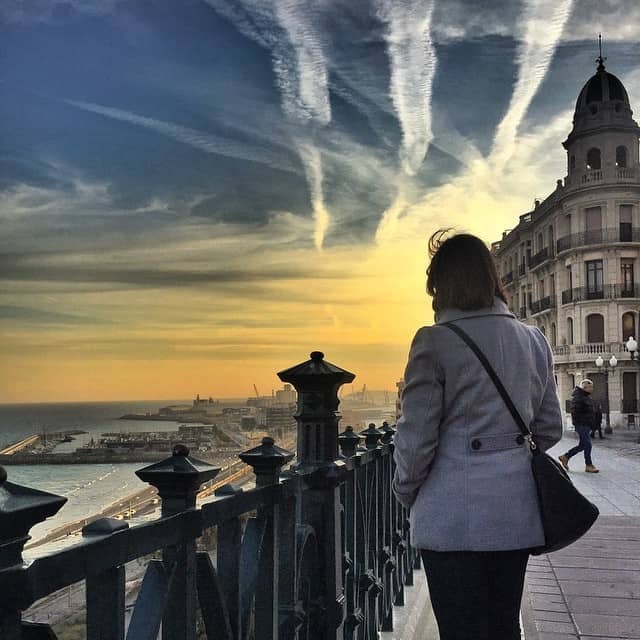 To see Tarragona’s old fishing neighbourhood then you can work your way down to El Serrallo, an unpretentious quarter facing the port, which also has the city’s best fish restaurants. Half-way down the hill is the newly-restored Mercat Central, a central part of daily life in the city, in a century-old modernist building. At the foot of the cliffs, on the other side of the train tracks is the main beach on Tarragona’s waterfront. You can cross the tracks via the tunnel near the amphitheatre, or on the level-crossing just past the station. It’s a long and enticing arc of golden sand, and there’s a short promenade on the east side, as well as bars, restaurants and nightclubs around the nautical club in the port to the west. 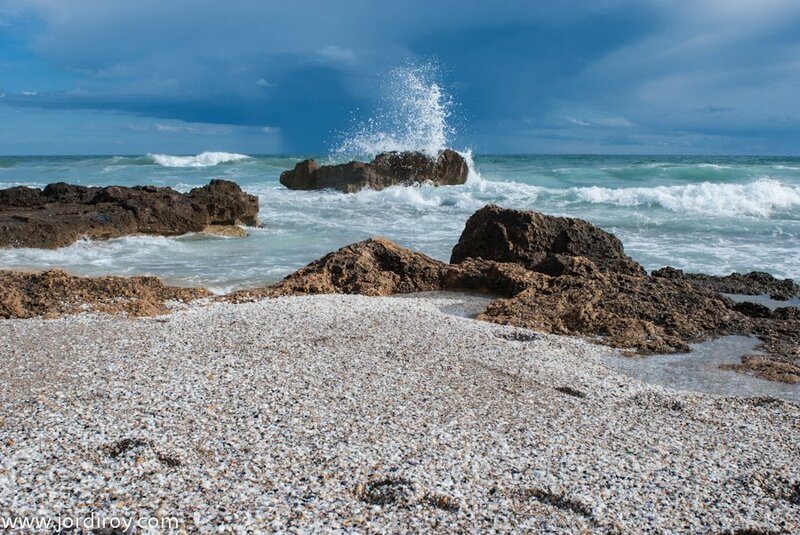 The waters have moderate currents, which, depending on the weather, might not always be suited to younger swimmers. Minutes up from Tarragona is a gorgeous sweep of coast, starting at Platja Llarga. This golden beach seems to go on forever and behind it are low-impact holiday communities and campgrounds with chalets. Eventually the beach gives way to Tamarit-Punta de la Móra, a natural park on a headland covered in pine forest. On the fragrant trails you can find wild herbs, mushrooms and asparagus depending on the season, and the paths will lead down to little coves like Cala Becs and Cala Fonda, where few tourists venture. 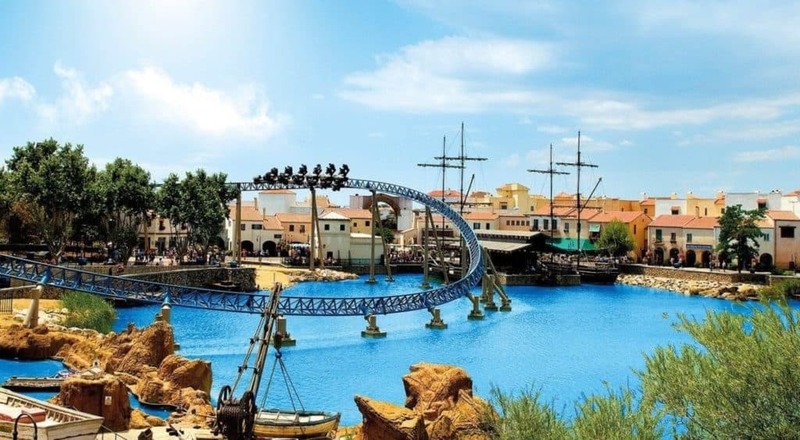 Surely the best family day out in Spain, and one of the most-visited theme parks in Europe, PortAventura is a ten-minute train ride from Tarragona’s Renfe station. How you spend your time is entirely down to your taste and the age of any little ones that you bring along. There’s a whole zone with a Sesame Street theme for instance, with eleven rides for younger visitors. For older kids and adults you’ve got white-knuckle roller coasters like Dragon Khan, which has eight inversions, or the Hurakan Condor, dropping you to earth from 100 metres. There are also shows for all ages, and a water park and golf courses as part of the wider resort. A half-hour road trip into Catalonia’s countryside will get you to El Poblet Monastery, a medieval UNESCO at the foot of a mountain range and overlooking vineyards. This marvellous gothic complex was founded in the 12th century by French Cistercian monks in the wake of the Moors’ retreat. It was part of a plan to shore up power in newly Christian Catalonia. The most historically significant part is the gothic Royal Chapel, where several Kings of Aragón were interred from the 12th-century Alfonso II to Juan II in the late-15th century. On the way to El Poblet, stop by the town of Montblanc, which is totally encircled by its medieval walls, protecting a core of old stone streets you won’t mind getting lost in. If you’re around during the winter then you have to give calçots a try. These are large green onions, roasted in their skins over wood-fires and then served with a romesco sauce made with nuts, garlic and olive oil. “Calçotadas” are get-togethers when people either go out to eat these delicacies or cook them themselves, and drink from porrons, wine pitchers with a spout that you’re supposed to lift above your head. Tarragona’s countryside abounds with vineyards (many making cava), olive groves and hazelnut orchards, and there are several great restaurants in the Part Alta serving seafood rice dishes like arròs negre. You may have seen castells elsewhere in Catalonia, but they’re native to Tarragona and have been around for well over 300 years. Teams compete against each other at the incredible Concurs de Castells, held in the Plaza de Toros every other October, but there are also events and exhibitions every year during the summer. People will gather in matching outfits with a sash that helps the people above (smaller and younger!) get a grip and climb. Then you’ll hear a fanfare from the gralla (a medieval woodwind instrument), and the tower starts to form. The towers usually reach between six and ten levels, and at the crown are children as young as five, wearing riding helmets for safety. There’s a monument devoted to this art-form on the leafy Rambla Nova walkway. From mid to late-September every year Tarragona almost literally explodes with fun, dancing and the celebrations are fuelled with no little gunpowder. Take the Correfoc, a traditional Catalan ritual where people, usually dressed up as mythical animals such as dragons, parade through the streets erupting with sparks from fireworks and making lots of noise. Sardanas are also performed at this festival, in which men and women hold hands and dance in a circle. There are nods to Tarragona’s Roman history, the city’s gegants and capgrossos (tall ceremonial sculptures) are also on hand, and you’ll also be sure to see Castells going up and tumbling down.